Deze Karako (唐子), een jongetje in antieke Japanse kleding, is een traditioneel ontwerp op zijde gebruikt voor haura, de achterkant van een haori (een jasje die over een kimono wordt gedragen). 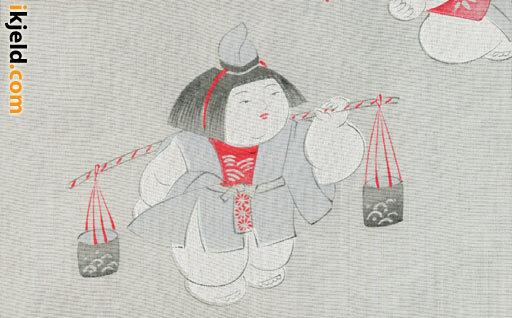 This Karako (唐子), a boy dressed in ancient Chinese clothes, is a traditional design pattern on silk textile used for haura, the back of a haori (a coat worn over a kimono). “The Earth was blue.” These were reportedly the words used by Yuri Gagarin, the first human in space, when describing his impressions after returning to Earth. He was referring to what is known in Japan as the color “ruri-iro.” This color was used in Egypt as early as 3,400 years ago in jewelry, which came to Japan along the Silk Road. 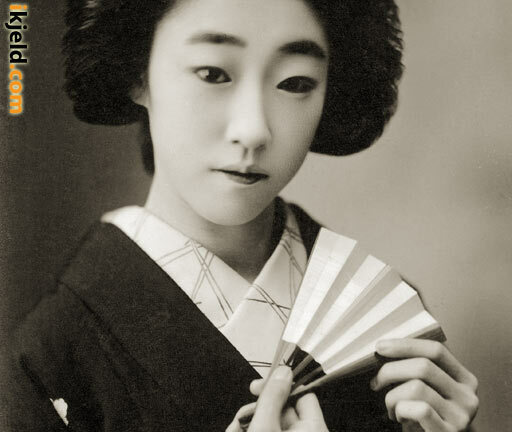 The folding fan was invented in Japan during the 8th century. Called Hiougi, they were made of thin stripes of hinoki (Japanese cypress) and used by aristocrats of the Heian Period (794-1185) as part of their formal attire. Eventually the Japanese fan was exported to China, where silk fans were used. They were transformed and re-imported as Chinese fans in the 15th century. Over the ages fans played an increasingly important role in Japanese culture. This is the color of robes worn by Buddhist monks in countries like India and Sri Lanka. This vivid yellow is the color of turmeric, an essential spice for curry foods. Not only does turmeric keep bacteria away due to strong antibacterial powers, it also believed to fight off evil spirits, so it is also used as sacred color in the religious context. Madder red (“akane-iro” in Japanese) is a color immortalized in the Manyoshu, one of Japan’s most revered collections of poetry (mostly written between AD 600 and 759), used mostly to describe the sun and sunset. There are many shades of red, but this one is used as an adjective for the color of sunset.